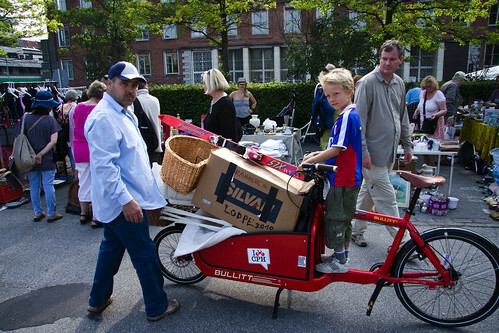 Once a year my boy Felix has a stand at a kid's flea market and our cargo bike is an integral part of the transport and display. 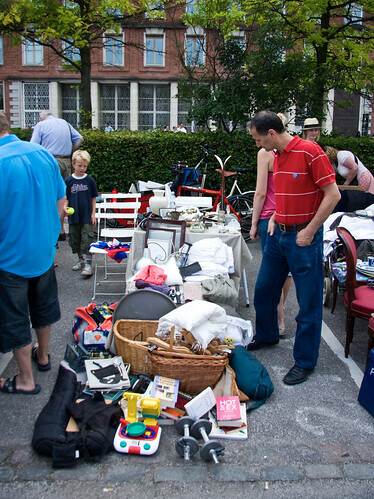 A couple of weeks ago we had a stand at a regular flea market, in order to free our lives and minds of 'old and useless stuff'. The Mother of My Children has a two-wheeled Christiania cargo bike and, together with my Bullitt, we transported everything we needed, including a table and two children, by cargo bike. It took one extra trip where I zipped home to fetch a load but it was great to do it all on two wheels. Here's our modest little stand. We actually got rid of most of the stuff, so the trip home was a breeze.